June 2, 2017 0 comments on "7 DIY Bird Feeders for Backyard Birdwatchers"
I love attracting birds to my backyard. Where I live there are a lot of finches, nuthatches, hummingbirds, and wrens, and we even have a few doves that regularly visit our yard. There are many different types of bird feeders to choose from, and many you can make yourself. I have found seven fun backyard bird feeders for you to try out. 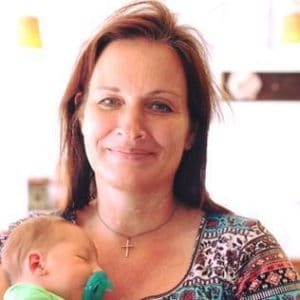 Give them a try and see what you think! Different kinds of birds are attracted to different kinds of foods. Apparently orioles enjoy orange slices and grape jelly! Here is an easy DIY bird feeder for orioles that you can make out of the lid of a jar candle. This is an easy bird feeder that you can make from an empty soda bottle or water bottle. This type of bird feeder you fill with wild bird seed that will attract a variety of birds to your yard. This bird feeder is also made from wild birdseed and will attract a variety of birds. This bird feeder you create by molding the birdseed into the shape of a wreath by pressing it into a bundt pan. 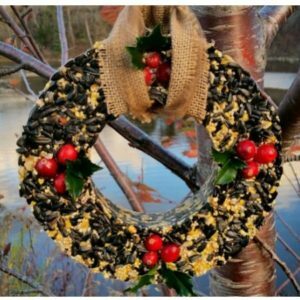 You can then hang your finished “birdseed wreath” out for the birds to enjoy. This is a fun bird feeder for kids to make. It is made from a hollowed out orange. You fill the orange with bird seed and hang from a bush or tree. This is a really neat bird feeder, seriously pretty enough to sell to people! Or at least to give away as a gift. This bird feeder is made from a mason jar and a small round chicken feeder. I’m definitely going to have to make one of these for myself. This bird feeder will take a little more time and skill, but if you can cut out the wood yourself, you will be really happy with the results! I made these bird feeders with my kids last year, and they were really fun and easy to make. You prepare the bird seed similarly as you do for the bird seed wreath, except you use cookie cutters instead to mold the bird seed. Quick and easy!